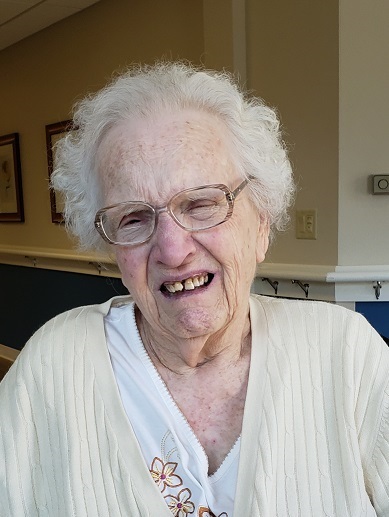 Nora C. Kuhnke, 87 of Geneva Township, WI, passed away on Saturday, January 19, 2019 at Holton Manor in Elkhorn, WI. She was born May 7, 1931, the daughter to the late Thomas and Alice Cummings. Nora was married on November 11, 1951 to Dallas Kuhnke in Sharon, WI. Nora was a social butterfly and loved taking care of and cooking for her family. Nora is survived by by her 8 children; Steve (Patty) Kuhnke, Margaret Harris, “Dallas” Tom Kuhnke, Carl Kuhnke, Cathy (Mark) Irek, Judy Meyer, Pam (Robert) Friesema and Arthur Kuhnke, 15 grandchildren; Tara, Steve Jr., Kevin, Brandon, Carrie, David, Jessie, Jamie, Kelly, Toni, Jenni, Josh, Matt, Phillip and Chris, 14 great-grandchildren; Madison, Caden, Laila, Katie, Gavin, Ella, Lilly, Sophia, Madeline, Brynlee, Kaylee, Livia, Ashton and Mali, brother, Thomas Cummings and two sister, Patti Cummings and Martha Hansen. She was preceded in death by her loving husband of 64 years, Dallas, parents and sister, Mary West. Funeral Service will be 11:00AM on Monday, January 28, 2019 at Haase-Lockwood & Associates Funeral Home in Elkhorn, WI. Visitation will be 10:00AM until service time on Monday at the funeral home. Burial will follow services at Southern Wisconsin Veteran’s Memorial Cemetery in Union Grove, WI. Online guest book at www.haaselockwoodfhs.com. Arrangements for Kuhnke Family handled by Haase-Lockwood & Associates Funeral Homes and Crematory of Elkhorn.